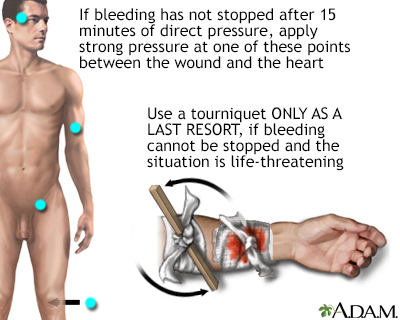 When there is severe bleeding where a major artery has been severed, pressure may be insufficient and a tourniquet may be necessary. Tourniquets are an effective way of stopping bleeding from an extremity. They do, however, stop circulation to the affected extremity and should ONLY be used when other methods, such as pressure dressings, have failed (or are likely to fail). Pressure from tourniquets must be relieved periodically to prevent damage to the tissue from lack of oxygen.